Hi I am Dharma . I started my career as a professional trekking guide, now I am a travel manager. I work as a guide since 1992. I have made tourism sector as my passion. There is no other occupation in my heart except trekking. With trekking interconnected works , I arrange for Sightseeing Tour, Jungle Safari, Hotel Booking and many more. I am a Government Licensed Guide since 1992, I have guided more than 4000 tourist and have been more than 100 times to Everest area, 150 times to Langtang area and 200 times to Annapurna area, both long and short trips. I also speak English, Japanese and a little Spanish. Besides Himalaya trekking and Tibet and Bhutan tours, I also do Homestay trips to Nepal villages, social volunteer teachers in countryside and adventure tourism such as Rafting and Jungle Safari. I can also book Hotels, transportation, Mountain Flights and Sightseeing excursions. In particular, why I need to open the Himalayan Car Rental Services ? As I told you, I guided more than 4000 tourist, it was very difficult for tourist to hire/rent a proper car with best price for their targeted destination. And many times same for me to arrange to rent car for my tourist. So, some of my good friends and some tourist themselves, suggest me that why I should not open the car rental service by myself. I thought about is seriously and work very hard to start this vehicle rental services. 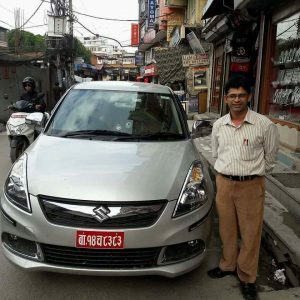 As soon as I started this car rental services, besides a tourist guide, I am able to rent a car for my tourist with best price & service in Nepal. I personally thank you my friends and my clients, as this service appeal to come more tourist. Kathmandu, Patan & Bhaktapur City Tour. For detail car hire service please go to services section.